"Can't get your dog to behave and stand still on the table at the shows? Does your dog stand still while he's examined by the judge? No? Well, we've got the problem solver!" The SHOW STACKERS™ are portable and lightweight, easy to travel with, yet strong and secure for your dog to feel at ease on. A few minutes a day training on the SHOW STACKERS™ will turn your fidgety dog into the confident show dog a judge will notice, and one you can be proud of! In the show ring, your dog may have to remain stacked for up to thirty minutes or more depending on the number of exhibits. Make it easy on yourself and your dog, train them on Showstackers. I don't get it. Won't the judge notice that the dog is standing on this device and realise that it can't stand still properly for itself? And what's to stop the dog just stepping off (or are they velcroed to it or something - I jest, of course)? Goes to show, show people go to any length to disabuse their dogs of any dignity all for those wretched rosettes. If there were any show people near me right now I'd bloody thump them. 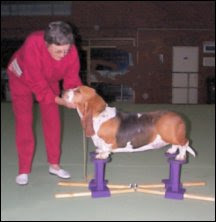 Julia you don't use these at the show, you use them on the poor dog at home to train it to stand still. Poor poor dogs. Oh dear...that's all i can say! Well - how bloody ridiculous. 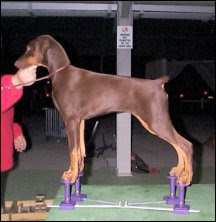 I suppose the theory is to train your dog to stand on this stacker thing, which it would presumably have to do for fear of falling, put the command to the action, then the dog would have learnt to "stack" in that position in the show ring when given the command. I call it lazy & cruel. 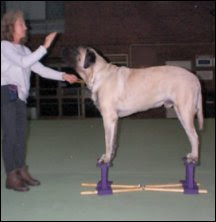 i have show dogs and ive never seen anyone use this. 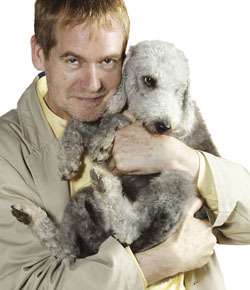 i suggest alf mcmalf seek anger management therapy. i would not choose to use one of these contraptions, but lets not get too carried away and make them out to be torture devices. afterall isnt a slip collar a potential ''torture'' device if used improperly? stop using this as yet another way to have a go at the show folk. I have heard about these. I am told that in America dogs, such as Springer Spaniels, are trained to stand for a long time in an abnormal show pose. They are strung up on their lead while standing on a version of this stacker. If they move, they are left hanging by their necks. where do you hear these tall tales? All for a rosette. The depths some people go to for one! Mind you, I saw a few months ago an item/advert in a dog magazine for a band to stop puppy boy dogs peeing. Mind numbingly appalling to think some absolute sadistic creature is thinking up cruel ideas for a clean carpet and a rosette. My heart breaks for the dogs, silently suffering, that have to live with all this. We use show stackers, they are not cruel in any way, the dogs love them, what is wrong with you people. Amazes me firstly how people like 'alfmcmalf' happily tar everyone with the same brush whilst gleely making their first statement one threats of violence?! I totally agree with Anonymous above...I don't see them as cruel in any way, and the dogs on the website look quite happy on them.. Anon is quite right too that people teach tricks to their dogs, for instance, like walking on their hind legs, which isn't a normal posture for them...Is this cruel?? I cant see standing a dog on four low to the ground blocks can be termed as cruel... Silly maybe but definitely not cruel!